Cooking is an art and, like any other craft, it only requires the best of tools to not only make your experience easy but to also ensure that you take great delight in what you create. Compromising on quality when it comes to picking your knives will simply not do; only choose the best sushi knife that will make your job smooth and safe. Japanese cuisine is famous worldwide for its taste, simplicity and unique style, however, if one was asked to pick a Japanese dish they absolutely loved above all others; the answer would be, of course, sushi. To make delicious sushi is perhaps one of the most daunting tasks for everyone, even professional chefs and to make perfectly presentable sushi, even harder. However, having the right sushi knife beside you is guaranteed to make the job palatable and smooth. To help you make this decision, we have a review of the top ten picks of this year which will guide you through the process of buying the best sushi knife. The Soufull Sashimi Knife ensures that anyone, whether it be a professional or amateur chef is able to smoothly cut through fish without having to put a lot of external effort. Its sleek, classy blade is perfectly complemented by the wooden handle which not only pleases the aesthetic sense of a chef but also allows you to confidently adorn your dish the way you desire. The product weighs only 8.8 ounces. The dimensions of this product are 12.8 x 1.2 x 0.1 inches. The sushi knife comes in a lovely, black packaging and contains one sashimi knife and one service card. The length of the blade 7.87 inches and the total length of the sushi knife is 12.8 inches. The knife does not need to be sharpened frequently. Lightweight and easy to handle; does not cause numbing of fingers. Ideal for giving as a gift due to the stylish packaging. Some complained that the edge should have been sharper. Certain customers had to frequently sharpen the knife with a whetstone. 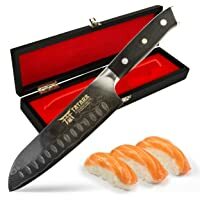 This brand not only promises an efficient sushi knife but also focuses on easy maintenance and complete safety. The handle material can be selected from between a traditional wood or a Santoprene handle which ensures the firm grip. Besides being razor sharp, with a sleek design, it slices through sushi without tampering with the shape of the rolls. With its amazingly affordable price, beautiful design and quality promise, this comes close to grabbing the title for the best sushi knife. The dimensions of this sushi knife are 3 x 2 x 20 inches. Made from German stainless steel. Comes in a beautiful wooden color. The size of this knife is twelve inches. Handle material is wood or Santoprene. Due to its convex grind design, vegetables can be sliced easily and do not stick to the blade. Super light with a slip-resistant handle. Beginner-friendly due to its simplicity and efficiency. Cuts food neatly with one swipe. Is resistant to rust and corrosion. Some buyers said that the wooden handle was a bit rough and could do with some finishing. 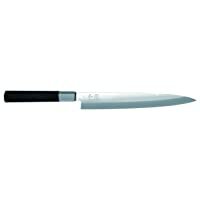 Customers also remarked on the thinness of the blade which limits the use of the sushi knife to dicing vegetables. 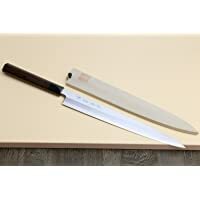 This sushi knife is made specifically for beginner and intermediate level chefs who desire to see precision and smoothness when they slice through boneless fish. Beautiful mist patterns on the blade are a characteristic of this sushi knife; these patterns are formed when the white steel of the blade is forged with iron, hence, the name Kasumi. Its beauty alone makes it worthy of being included in our list for the best sushi knife to own in this age. 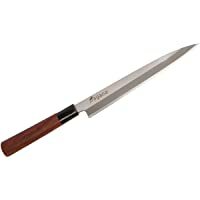 A magnolia blade cover, rust eraser, and knife eraser are included within the package and, like other best sushi knives, this particular knife should also be washed by hand. 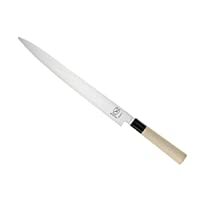 Single-bladed with varying grounds on each side of the knife, this item is a must-have for every professional chef who cannot compromise on quality! The dimensions of this knife are 21.3 x 2.4 x 2.4 inches. D-shaped handles made from either magnolia or rosewood. Knife sheath made of magnolia. Made from white high carbon steel. 270 mm blade with a flat-ground on the front side. Very sharp blade, ideal for precise slicing. Comfortable to use as the handle is smooth and shaped to fit the hand perfectly. Knife sheath included which retains the sushi knife in its initial, perfect condition. Ideal for gifting as the knife has high aesthetic value. Different grounds on the front and back increase efficiency. 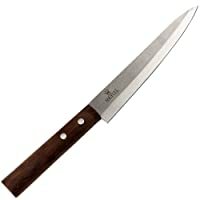 More expensive than other sushi knives on this list. Can only be used by professional chefs. Cannot cut through anything hard, designed to slice through fish. This Yanagiba sushi knife is not only known for its beautiful, smooth and thin slicing but also for its overall neat finish and well-built blade. This knife is dishwasher safe, unlike other sushi knives which require much more maintenance and is affordable for the entry-level chef. The blade is embellished with the Japanese word for Wasabi which adds to its beauty. Created from a polypropylene mixture, the handle is ergonomic and sturdy enough to minimize the pressure that you exert while slicing. 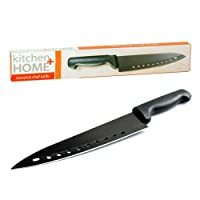 This ensures that you do not experience any discomfort, numbness or pain while making sushi since some low quality knives tend to hurt your fingers. Created with high-carbon, stainless steel. The dimensions of this product are 13.2 x 0.6 x 1.1 inches. 9-inch sushi knife with blades sharpened on the single side. Very sharp due to the ground design of the knife. Retains sharpness for a very long time. Knife handle makes use comfortable and convenient. Buyers said that the diameter was relatively small which took some time adjusting to. Some customers would have preferred if it weighed a bit more. This Yanagiba knife is a delight to customers because of its incredible affordability and modern design. It’s not only resistant to rust but its molybdenum, the steel blade is able to efficiently slice through raw fish! 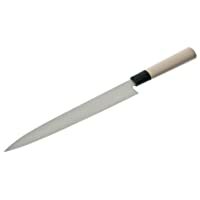 The wooden handle offers maximum comfort and the plastic bolster makes it very easy to sharpen this sushi knife on a whetstone. 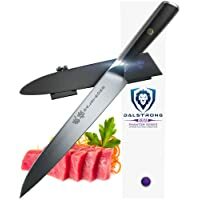 It does not require exceptional care as compared to many other knives and is completely beginner-friendly in its usage and design. Can be used to cut through a variety of products and is a steal for its price! Length of the blade is 9-1/8. Total length is 14 inches. Dimensions of this product are 11.8×7.9×7.9 inches. Rust-resistance increases the life of the sushi knife and maintains its sharp edge. Sharp edge makes slicing very easy. Lighter than many other sushi knives. Solid construction which makes the knife last long. According to some buyers, the blade was slightly curved. Products tend to stick to the side during cutting. Needs to be frequently sharpened. This premium quality, best sushi knife is known for both its efficiency but also for the gorgeous packaging it arrives in which makes it the perfect gift for your friends and family. 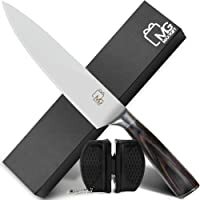 The sleek, modern, wooden box that carries this promising knife speaks for itself because this razor-sharp knife is sure to leave you dazzled at its brilliance in the kitchen. Very sharp with sixty-seven Damascus layers. Has a core of 62+ Rockwell Hardness. Solid construction with a non-stick edge. Comes with a free cloth to polish the knife. Dimensions of this product are 17.1 x 4.1 x 2.8 inches. Beautiful packaging makes it the perfect gift. Construction makes cutting and slicing incredibly easy. Products do not stick to the knife. Some customers received their sushi knives without the divots on the blade. Heavier than the ideal weight. Number 7 on the list of best sushi knife is this masterpiece which promises quality, affordability, and precision. Crafted with the needs of every chef in mind, this sushi knife comes with an incredibly hard, multipurpose blade. The handle is made from sturdy Pakkawood and is not only durable but incredibly light. Dimensions for this sushi knife are 15 x 3.8 x 2 inches. The weight of this knife is only 8 ounces. The blade is made of high-carbon stainless steel. Lightweight and perfect for beginners. Beautiful polish gives it a lovely finish. Perfect for gifting due to its package. Handle does not provide proper grip. The blade is not as sharp as it ought to be for a sushi knife. From home cooks to professional chefs, everyone loves the Sagana Sushi Knife for its authentic beauty and precision while slicing through vegetables and fish. The rosewood handle maintains a proper grip on the knife and the ultra-sharp, stainless-steel blade allows you to present the dish of your dreams without uneven cuts! Handle created out of rosewood. Dimensions of this product are 13.2 x 1.2 x 0.9 inches. Well-balanced in terms of weight. Single-beveled; this makes it ideal for making sushi. Does not come with a sheath which lessens sharpness over time. This narrow sushi knife is perfect in its swift precision and sharpness. Made out of Japanese steel and nitrogen-cooled for maximum sharpness, the handle is created from laminated Pakkawood just for your comfort. The hand-polished spine adds just another touch of elegance to the overall finish of this fine culinary tool. The dimensions are 17.1 x 3.7 x 1.3 inches. Dalstrong support with full tang. Sharp edge for swift cutting. Well-balanced with a mirror finish to the blade. Comes with an added sheath. Some buyers found it thicker than what they preferred. Customers said that they would have preferred a more traditional touch to the sushi knife. The final product on our top ten sushi knife list is known for its very affordable price, flexibility, precision and merciless sharpness. Not only is it non-stick due to its Teflon coating but also comes with a rocker blade design that makes it truly versatile in the kitchen! Dimensions of this knife are 13.4 x 2.2 x 1 inches. Designed with thin, aerated, razor-sharp blades. High carbon stainless-steel, 8″ blade. Teflon-coated blades to ensure that nothing sticks to the blade. Ergonomic style of the handle makes cutting comfortable. Dulls after a few uses if not cared for properly. Loved by professional chefs and home cooks alike, these sushi knives are sure to bring your sushi rolls to complete culinary perfection. Achieve your culinary dreams by selecting any one of these and ensure accuracy by making sure you do not destroy the rolls that you strived so hard to create. Select your own favorite, best sushi knife and feel the luxury these knives allow you with their unique designs and unrivaled precision!